​Get frocked up in your flapper and dapper finest and head to The Sideshow for a night of Swingin’ Cabaret featuring dancing dames, fearless fire twirlers, cool jazz hep cats, burlesque babes and stunning circus stars! Plus DJ Saucy Moustache will be cranking out the sauciest Electroswing tunes into the night, so don’t forget your dancing shoes! 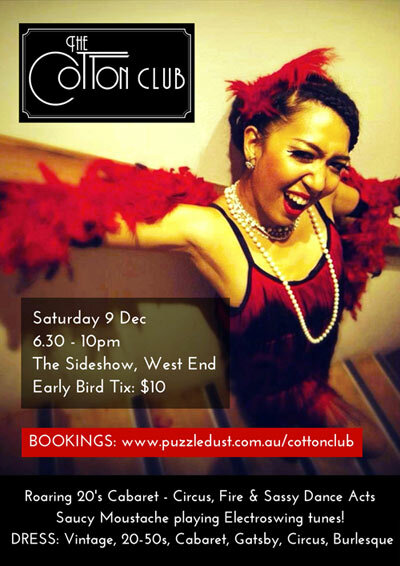 This is your chance to dress to impress – think Gatsby, jazz, vintage, zoot suits, 1920s - 40's, rockabilly, burlesque, cabaret, mobsters, swing, flappers, dappers, pin-ups!